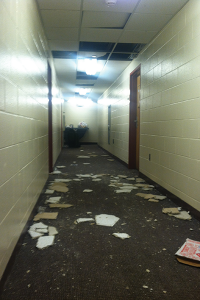 Commons residence hall has faced numerous acts of vandalism including broken ceiling tiles, smashed windows and torn hallway decorations, according to residents and resident assistants. Residents say it is beginning to negatively affect the image and reputation of the residence hall. 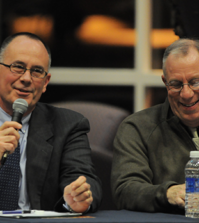 The most expensive acts of vandalism were smashed-in ceiling tiles this past fall semester, according to Barger. A few tiles on the first and third floor, along with most of the tiles on the second floor, were broken into pieces and left on the hallway floors. This past weekend, students were brought in for questioning about the incident after other students came forward with information. Barger has confirmed that several students have been identified who were responsible for these damages. These students will now have to go through the process of facing residential life and the judicial board. According to Barger, the punishment for these students has not yet been decided. First floor Commons resident Maria Mucci saw a few broken tiles by her room. Mucci believes that the resident assistants are not at fault in these situations; however, she is getting frustrated. 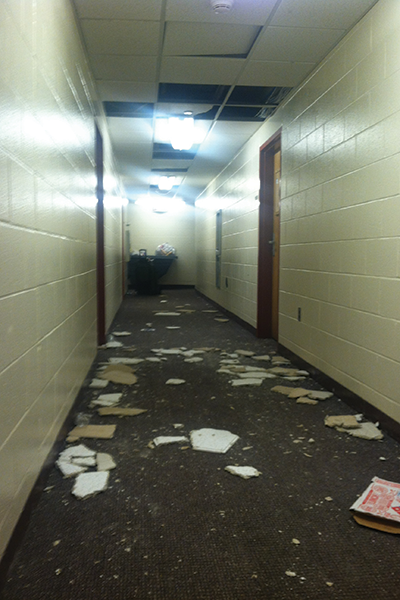 Commons resident Christopher Lynch witnessed people punching ceiling tiles on numerous occasions. Decorations are also regularly torn down in Commons. Both Lynch and Mucci have had name tags ripped off their door. Mucci also noted seeing inappropriate words written on whiteboards and cork boards, as well as seeing her resident assistant’s hall decorations being written on or torn down. According to Barger, this is considered vandalism. “Vandalism is whenever someone intentionally damages someone else’s property. 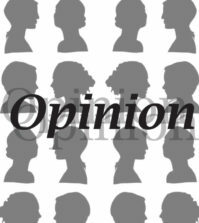 It is criminal mischief,” Barger said. Mucci noted that the peepholes were removed and stolen in January. Commons resident Cari Gaynes and her roommates recently had a window broken. The girls noted that they were in the room next door when they heard a noise, followed by boys shouting and running. It was not until the next day, when Gaynes went to open the window, that she saw broken glass on the window sill, as well as outside on the sidewalk. Gaynes and her roommates put in a work order, which was immediately attended to.